The shelves in store cosmetic departments sag from the weight of jars, tubes and bottles of moisturizers. And prices range from a few bucks to about the price of your monthly electric bill. So how do you know which one will work? Here’s our quick and easy guide to moisturizers. Basically, moisturizers create a barrier between your skin and the outer world, keeping moisture in and bad stuff out. One of the main differences between moisturizers is the ratio of their water-to-oil content. An ideal moisturizer will attract, bond and trap moisture. By reviewing the ingredient list, you’ll be able to tell what a product is likely to do. Products that contain humectants, such as propylene glycol, aloe vera gel and glycerin attract water out of the environment and onto the upper layer of your skin. If your moisturizer contains coconut oil, shea butter, squalene or jojoba butter, these emollients will bond moisture to your skin. This minimizes the appearance of fine lines. Occlusives are ingredients like mineral oil, lanolin, zinc oxide and dimethicone, which trap moisture. While too much can clog your pores, in the right doses occlusives are beneficial. Cheaper moisturizers go heavy on occlusives. High-end moisturizers contain a higher percentage of emollients. 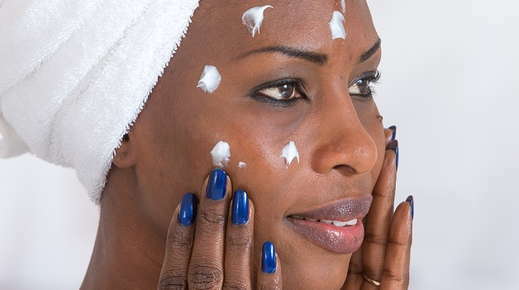 Your skin type dictates which moisturizers will work best for you. If your skin is sensitive, choose soothing ingredients like chamomile or aloe. Avoid unnecessary added ingredients, such as dyes and fragrances. Acids can also irritate sensitive skin. People with normal skin do best with water-based moisturizers. Choose products with lightweight oils, such as acetyl alcohol. If you have dry skin, you’ll need a heavier moisturizer. Some people even use petroleum to prevent water from evaporating off the skin. People with oily skin need moisturizer, too. But you'll want to pick one that is light. Look for the word “noncomedogenic” on the label. That means ingredients won't clog your pores. And of course, as skin ages it needs even more moisture. If your skin is mature, bypass the lotions and look for creams, balms and oils. Try moisturizers that contain alpha hydroxy acids and lactic acid. Depending on your age, hormones, health, the season and climate, your skin can change. If one product isn’t working anymore, shop around. After cleansing your face with a gentle soap, it’s time to moisturize. Apply a nickel-sized amount, gently smoothing it into your skin with your fingertips. During the day, use a moisturizer with sun protection of at least SPF30. If you like using anti-aging serums or creams, nighttime is the right time to let them soak in. Be especially gentle when applying creams to the sensitive, wrinkle-prone skin around your eyes. Need some additional guidance? We love to help our clients find the right beauty regimen for them. Call us today and we’ll be happy to talk moisturizers with you. Have a Question for Our Staff? Need a later or earlier appointment? Just send us a message!